Minnowstar hardly wanted to hold this meeting, after everything that happened. Didn't want to spook the Clan, to be honest. A meeting was typically a serious affair. And after the loss of not one but two HPs, not even Minnowstar could handle more bad news. Which is why she hoped to bring some joy to the Clan for a moment, with the promotion from kit to apprentice. And not just any cats were to be promoted, it was her own children. Part of her heart filled with pride for her children, mixed with shock at how much they've already grown. If only their biggest supporter, Glacewing, and their older brother, Wheatbloom, were here to see this. But they weren't. So the lilac tabby shakes her head, and leaps to the top of her den to call the Clan together. "Cats of SkyClan, gather 'round for a meeting." Whitekit had been lounging around in the shade with Wolfkit, surprisingly having convinced her earlier to actually sit still and not cause trouble for a little while. He thinks the comment about having missed her while he was gone really did the trick in settling her down. Glancing up at his mother's call for a meeting, Whitekit pushed to his paws and stretched before padding closer to where they usually gathered for meetings in camp. He wasn't entirely sure what this meeting was about, but thought absently that maybe Minnowstar was already about to appoint a new deputy. The gray she-cats dark green embers landed on Minnowstar as she called for SkyClan to gather around her for a meeting. Without a question she immediately began to stride over to the scene, her tail flicked, laying low to the ground. Slowing down, she sat down near the outskirts of where others would gather, putting all of her attention onto Minnowstar, curious on what was to be said or done this meeting. Brookpaw's eyes were hollow as she trudged out from the medicine den on weary paws. She hadn't been sleeping well since Wheatbloom had died, her nights growing longer as she suspended wakefulness, trying to teach herself as much as she could and keeping here eyes on all of her Clanmates at once. She was determined not to lose anyone else after Glacewing and Wheatbloom had perished so close together. Sitting down heavily on the ground beneath Minnowstar's position above the Clan, the medicine cat apprentice tried not to doze off where she sat before the meeting even started. There had been so much death in Skyclan lately that it was no surprise that everyone looked depressed. Starclan, she was feel down too. Glacewing had hit hard, Daisyfrost hit harder, and Wheatbloom seemed to knock her down. Rainpaw had been close to the deputy and honestly thought they live to one day be the leader. She wasn't the closest with her mentor but she owed Daisy a lot, and it hurt knowing they wouldn't see her become a warrior. The medicine cat had also been her mentor once and now Brookpaw was on there own. The apprentice sat down and looked up to the leader, hoping some good news was coming along. "" . Brookpaw spared Rainpaw a glance from across the clearing, but didn't have the energy to go join her friend. She longed to - to mourn with the former medicine cat apprentice over Wheatbloom - but she couldn't. Her paws were heavy with exhaustion and grief. She was barely past six moons of age, and already shouldering the weight of being the medicine cat while still an apprentice, supporting a leader without a deputy. It was hard, but Brookpaw was determined not to let anyone else down. She refused to let anyone else die. Minnowstar surveys the Clan from her position from above, deciding enough cats have joined in for the meeting to begin. As Brookpaw takes a seat nearby, the leader makes a mental note to speak to the medicine cat apprentice one-on-one. The poor girl looks exhausted, as exhausted as Minnowstar feels. She wants to make sure the only medicine cat in the Clan, and the only other higher up, was taking care of herself. "Before we begin, I just want to say how proud I am to be the leader of such a resilient Clan," Minnowstar starts, her grieving voice strong and genuine, "We've lost Daisyfrost, Wheatbloom, and Glacewing all since the last meeting. I know how hard this is for all of you. But we are strong together, and together we will keep their memories alive." With a nod to herself, she moves on, "And the circle of life continues. Today we have new warriors, and new apprentices. First Rainpaw, please step forward." Minnowstar takes a second to jump from her higher post to stand before the apprentice, "You have had a longer road than most your age, and it is by time you become a warrior." "I, Minnowstar, leader of SkyClan call upon my warrior ancestors-especially Whearbloom and Daisyfrost-to look down on this apprentice. She has trained hard to understand the ways of your noble code, and I commend her to you as a warrior in turn. Rainpaw, do you promise to uphold the warrior code and to protect and defend your Clan even at the cost of your life?" 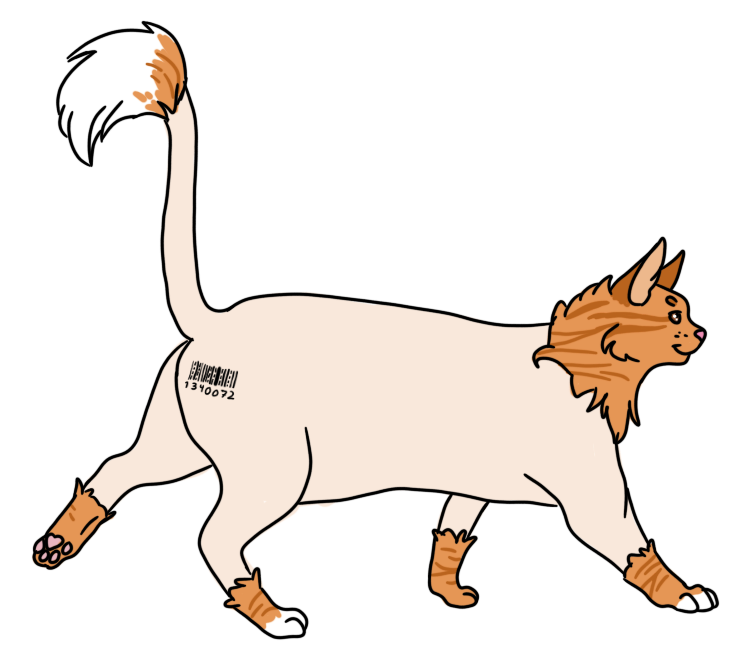 And waiting for the proper reply, Minnowstar continues, "Then by the powers of StarClan, I give you your warrior name. Rainpaw, from this moment on you will be known as Rainpuddle. StarClan honors your loyalty, kindness, and intelligence, and we welcome you as a full warrior of SkyClan. Daisyfrost would be proud, my friend." Neutral was his emotions as of late, so much loss had drained him of his inner spite. Though not entirely of course, just enough to keep him from lashing out as quickly as usual. He focused his inner rage on hunting of course, re-directing his targets to the prey. Unapproachable will he ever be but at least he was much more focused, a bit mroe hesitant. He knew who not to hurt now, and Rainpaw- no, Rainpuddle, Minnowstar, and Brookpaw were a few of them. The kits however, would forever be at the mercy of his wrath. Not being one to approach without reason, ontop of being ridiculously exhausted, the mahogany brute found himself sitting next to Rainpuddle oddly enough, just in time to hear her warrior name being called. An uproar came from Skyclan, repeating the name into the frosty air and drowning out the sounds of the forest. Wordlessly, Barkscar flicked his tail toward the One-eyes molly and touched her shoulder gently, a silent ‘congratulations’. "Beautiful name." he meowed stiffly, as though he wished to sound un-authentic for the sake of his pride, no doubt the intellectual feline would see right through. Then his eyes fell on Brookpaw, cursed to wear upon her shoulders the weight of the title Medicine cat. So young, he almost felt sympathy cast itself over him, fooling the anger that stewed within him eternally. Unexpectedly of himself he found his bony white paws carrying him over to the young grey molly. The scent of herbs plaguing his nostrils, his eyes soaking in a blatant analysis, she is tired. "If there is anything I can fetch for you tonight. Let me know." he whispered, his voice rough as nails, his brows pushed together displaying his usual disgruntled look. "I know you will be working overtime, just as Minnowstar is. Least I can do" he added briefly, face displaying none of the sympathy he felt. Blinking wearily up at Barkscar's approach, Brookpaw found herself startled by his offer. But she softened after a moment and shot the elder warrior a grateful look, dipping her head as well. "Thank you, Barkscar. 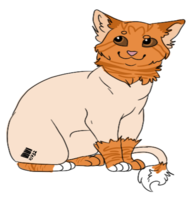 Minnowstar and I are lucky to have you among the ranks supporting SkyClan." The little chartreux she-cat managed a quiet purr as she turned her attention back to the ceremonies Minnowstar was conducting. Part o fher wondered if Barkscar would remain beside her for the rest of the ceremony, or if he would wander off. She didn't mind either way, knowing that Barkscar was a lot like Wheatbloom used to be - kind of distant, but always present. Her heart began to pound with joy as her name was called out. Getting to her paws, the apprentice stepped forward and stared up at Minnowstar. Listening to them start the ceremony, the she-cat wondered if Starclan would approve. Would Daisyfrost and Wheatbloom approve? She had made a lot of mistakes the past couple of moons. But she finally felt like she was back on track, and she was going to become the best warrior Skyclan had ever seen. "Of course." she answers, knowing that promise meant everything when becoming a warrior. Loyalty, kindness, and intelligence. It was a little awkward that she had lacked those things recently. Breaking the code, sending her kits away, and being a fool to go to Bloodclan once. No. Rainpuddle had those traits and she was going to start using them for her clan now. Her eye beamed with joy as she looked around for reactions. The first one she noticed was Barkscar. "Thank you." she breathed out, not expecting such kind words from the warrior. Brookpaw was ecstatic for her friend, chanting Rainpuddle's new name with the rest of the Clan. The exhaustion was weighing heavily on her as she mustered the energy to participate, but it was worth it. It was beyond worth it. Rainpuddle had been through so much, and Brookpaw had watched her go through most of it. The fact that the other she-cat had made it this far and was still standing was incredible. death, death, so much death. death was a bad thing, though stonekit didn't fully comprehend it. he didn't want to dwell on it though. it couldn't be that bad, right? good news always came afterward, to which the silver kitten purred contentedly. "congrats yo," he meowed to the new warrior. Minnowstar dips her head to the new warrior before moving on, her chest feeling like it will burst with pride at any moment. Her kits, her kits were about to be made apprentices. When did they become so grown up? Amber eyes look for Whitekit and Wolfkit and the others who are inactive rn as they sit together in the crowd. "Wolfkit, whitenose - , et all. Step forward. I know you've been waiting for this moment for a long time." Their mother waits a moment to allow them to come closer before beginning, "From this day on, you will be known as Wolfpaw and Whitepaw. Wolfpaw, your mentor will be [NPC], Whitepaw, your mentor will be [NPC]. Treat each other well, I expect to hear great things." Whitekit - or Whitepaw now - was practically vibrating with excited energy, but he kept it subtle. He had been looking forward to this since his return to SkyClan. He had been forced to hone his hunting and fighting skills during his time away from the Clan, and he was eager to polish and advance them through proper training as he grew. His mother's eyes were shining as she gave him and his siblings their apprentice names. Whitepaw was beyond excited for the future, and he allowed his tail to shiver with anticipation. The almost furless tom sat in the camp curious about this meeting. He's never been in one but has been in a group discussion with his neighbors. Leo cocked his head. He had told Lavenderskies and Silvertounge that he'd stay here and attempt to become a warrior. Now with his fat belly being reduced to just a plump state, he was scared on how much wheight he'd loose. Within the caressing walls of the nursery, a quiet orange bundle tucked himself snugly underneath his mother's belly. Her tortoiseshell head rose when Minnowstar called the meeting, but she didn't move, for the four kits at her stomach were sleeping soundly and shouldn't be disturbed. As the meeting didn't sound urgent, she suspected she could receive the news from her mate Thornbelly later in the afternoon. Back down at the cream belly of Briartail, Pollenkit shifted, releasing a cute yawn as he cuddled deeper within the sides of his brother and sisters. A small exhale sounded like a snore out of his nostril before he stilled again, flank rising and falling with the rhythm of his breath.